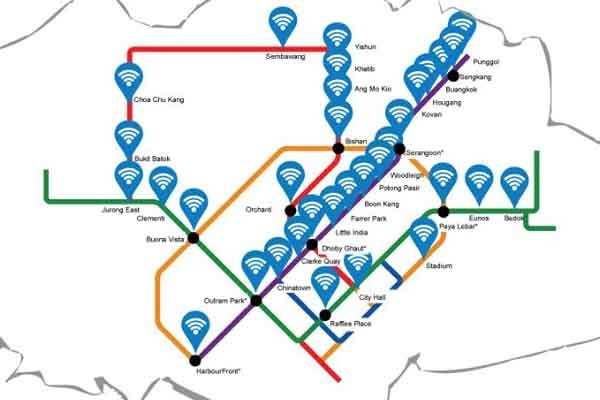 It was announced this morning that 5 more MRT stations will be a part of the WiFi connectivity pilot programme, initiated by Land Transport Authority (LTA). These stations include: Buangkok, Kovan, Little India, Paya Lebar, and Potong Pasir. Across Singapore, 33 MRT stations are a part of this scheme. As commuters are on the train platform they may connect their mobile devices to the free WiFi service provided. “Enabling the first 33 stations with the free WiFi service is part of our programme to provide wireless coverage on our public transport network. This enhances the commuting experience by providing an ‘always connected’ journey for commuters who need to check their emails or read the news during their commutes. We are very encouraged by the growing usage of the WiFi service at MRT nodes. LTA can also use the data to generate useful insights on crowd behaviour and improve the delivery of our public transport services,” stated Mrs Rosina Howe-Teo, Group Director for Innovation and InfoComm Technology (LTA). It is estimated that 70,000 daily logins are made throughout these stations. Since the official launch of the WiFi connectivity pilot programme, the number of logins has four-fold. The ultimate goal is to provide WiFi connectivity to all MRT, LRT, bus interchanges, and terminals, by the year 2020. This programme works in line with the vision of the Smart Nation initiative. As more and more WiFi access points are being provided, Singapore is reaching closer to meeting the demand for greater mobility throughout the nation.